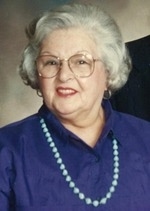 Vi Patterson, a Charter member of Orangeville Chorus, was first and foremost a lady. Her full name was Viola and she loved to use it. Vi lived life with joy and abandon. She loved to sing and was a proud member of the lead section. At Orangeville Chorus’ Charter Night celebrations, many local dignitaries were on hand, one of them Vi’s husband Arnold, who was Reeve of Orangeville at the time. Both she and Arnold were very involved in the Orangeville community and in their church. Vi did everything ‘properly’ and always knew the right thing to say. She could be both ‘charming and alarming’ as her sense of humour was terrific. She loved to shop and on music school or International trips she bought pretty much everything she could. Some of our members have fond memories of Vi at ODSS where she had a successful career in the administration department and was always a friendly and familiar face for students. Vi was one of several ‘only children’ in the chorus and thought it was quite a special designation! However she has a chorus ‘relative’ connection that was discovered after her passing… she was a second cousin of Bill McCrea (Fay’s husband). One of the chorus’s early shows had the theme of a ‘Girls School’… namely ‘Miss Harmony’s School for Girls’. Vi had the role of ‘Miss Harmony’ and carried it off so well, with just the right sense of the school marm, and perfect attitude and fun for the character. On the Board for many years, Vi loved hosting Board meetings in her home, and was forever searching for files that she was pretty sure were ‘under the bed’! Vi was a survivor. When the Big Tornado went through in 1985, she was working in the family business in Patterson’s furniture store in Mono Plaza on Highway 10. The store was levelled to the ground. Vi hid under a table when the storm blew through. She came to Chorus the next week to show us her ‘tornado scar’… a small scratch on her forearm! Vi kept up interest in the chorus after she was no longer a member, and enjoyed hearing us sing when we visited Lord Dufferin Centre where she was a resident. She also connected there with former chorus member, and good friend, Joan Lockhart, where they reminisced about ‘chorus good times’.